Fab Design took a perfectly good McLaren MP4-12C and butchered it, then presented their handiwork at the Geneva Motor Show. The McLaren MP4-12C is one of the most exclusive and beautiful of today's supercars. It has the kind of sleek, aggressive beauty that only simple design lines with exquisite attention to each minute detail can bring. It's the kind of car you'd never, ever want to see in a chop shop and definitely not the kind of car you'd enjoy seeing butchered by people who's only tool is a hacksaw. Yet someone decided to let Fab Design have one anyway. The result is horrific. Fab Design's major claim to fame is the ability to make big holes in otherwise perfectly good cars. They do this to "tune" airflow and cooling. Or to add "extras" like tiny viewports in the roof. Their treatment of the McLaren MP4 goes along these lines. It's hard to see a spot that someone in the Fab Design shop didn't see as a prime place for a new or larger hole in the car. The intakes ahead of the rear quarter have been massively flared and the inner duct split de-accentuated to give the appearance of a backwards fish gill. The grill, which on the McLaren is actually a pair of large ports where the fog lamps might otherwise be, were flared open like huge nostrils by Fab which makes the headlamps above look shrunken to beady little eyes. At the top of the hood a new slit was added, which has no discernible purpose other than to help destroy the aerodynamics of the car's profile. Above that, at the center of the roof atop the windscreen, a squarish glass portal has been added while the mirrors on either door were remounted on flimsy-looking wire-style mounts. The hacking continues on the back of the MP4-12C, where every square inch of the tail is given squarish holes and angled slashes to destroy all styling. Not content there, Fab finished off the butchering with a huge, ugly spoiler that even the over-styled Too Fast 2 Furious crowd would find appalling. What could be worse than this? 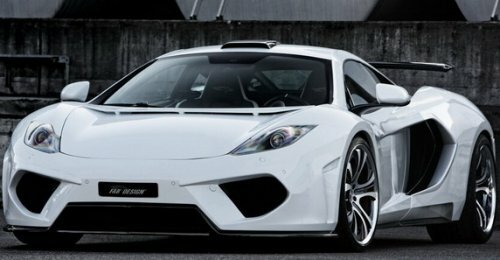 Mansory and Gemballa are set to unveil their own "tuning" treatments of the McLaren. The only tuning shop more fond of the hacksaw than Fab Design is Mansory. Cover the little ones' eyes and back away, folks. It's gonna to get ugly.